I wanted to add some air borne birds, well in this case Geese but did not want to use wire to fix them, so (and it is a bit of a cheat) I glued their wing tips to a tree. Interesting idea. However, might I pose a question and this is not a criticism, just an observation? How do you reconcile moving trains with birds which forever remain static, frozen in flight? The same is true of model people. Many years ago Airfix produced a box of civilians, one of whom was forever frozen in the act of running for his train. The trains came and went and out little man was still running but getting nowhere. He even ran to catch his train when the platform was empty. As regards people, this lack of movement can be overcome to some extent by only selecting people who are in repose i.e. possibly just stood or sat, waiting for a train, reading a newspaper, smoking a cigarette, etc. etc. I guess the same idea of 'repose' could be used with birds and animals. However, I have yet to see a realistic offering of a static bird from our current crop of manufacturers. Terry that is a very good question. To me a model lay out is just a giant 'vignette' for me to move my trains through. Regardless of what actions people are doing they are rarely, if ever totally motionless, eyes bink, chest raise and fall and we are constantly adjusting our balance. On top of that non of my trees are moving in the breeze, non of my steam engines generate any steam or smoke and my diesels have no exhaust fumes. There are systems available to allow cars and the like to drive around, again no exhaust fumes. Max that is a great photo. Scene looks amazing! Western Way wrote: Terry that is a very good question. To me a model lay out is just a giant 'vignette' for me to move my trains through. Regardless of what actions people are doing are they are rarely, if ever totally motionless, eyes bink, chest raise and fall and we are constantly adjusting our balance. I think the birds look great !!! I too think they look great ! They give an impression of life on the layout without going over the top IE the man running for a train that isn't there. I think Max's scene does the same thing, with the three men and the birds, giving a snapshot in time . 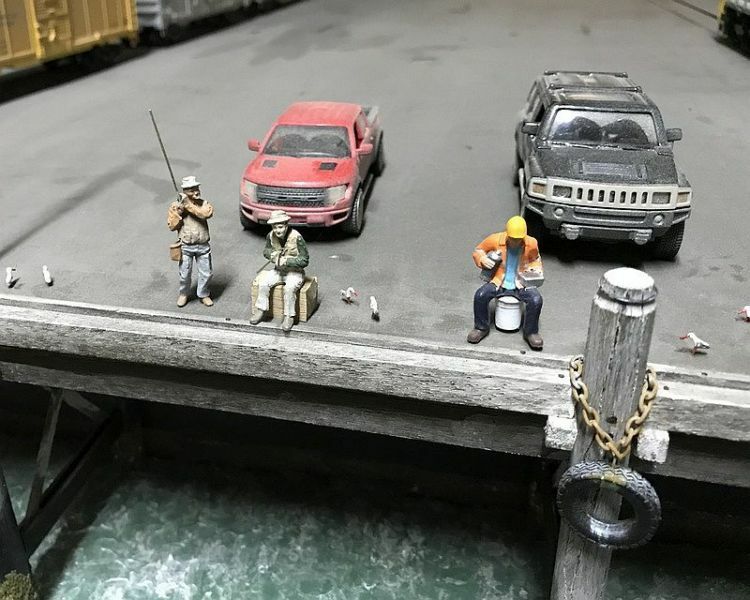 If they worent there it would just be an empty miniature world. But. . . . Come on now Max this is O gauge, I'm sure you could have arranged a moving cameo where the fisherman's cast lands in the workmans lunchbox, hooks up his sandwiches into the air with the birds chasing them ! ok OK I'm going !! You'll have to search YouTube for that, Matt. Peter. One of our club members turned up with his latest train (of German origin I believe). Believe it or not, everytime the train stopped the doors opened and closed, accompanied by appropriate noise. The man running for a train which isn't there most of the time may be a bit daft, but for a moment it's spot on! I saw a wonderful 2mm layout at an exhibition last weekend and the detail was incredible, with everything prototypical to the actual location. Then there was this lady waiting at a bus stop and when the bus came along, she raised her arm to stop it and it stopped. Wow! Fab and groovy and when the bus set off again, she was still there! Brilliant modelling and it was totally believable right up to when the bus drove off. However, the bus driver was her husband and he had forgot to pick up his sandwiches. Ha! All forms of movement on a model railway is a good thing and that looks like an interesting alternative to the Faller Car System, amoung others. After seeing a convincing working scenario of road action recently, it's something I think can only be worthwhile and good fun too. Hmm, not sure how to get a convincing moving horse drawn vehicle yet though! Strangely I have a major problem with people frozen in motion but not this. The birds look great John.